Sugar allergies may be uncommon, but a negative reaction to sugar is quite common. You may not notice it, depending on how attuned you are to your body, and if you have other health issues masking the sugar problem. Sugar usually means sucrose, a refined disaccharide. More generally, it refers to any monosaccharide or disaccharide, including glucose, fructose, sucrose etc. Sugars are derived from natural sources, but by the time they reach food, they are generally anything but natural. The high levels of refined sugar in the average western diet ranks as one of the top health hazards of our time. Natural sugar, such as honey, is quite different, although too much of any kind of sugar is bad for your health. 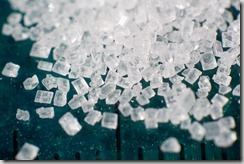 Too much sugar is the cause of type 2 diabetes. It is also a major driver in obesity, although other refined carbohydrates in the main-stream garbage diet is also a major factor here. Many people have a negative reaction to sugar. Some people feel completely wiped out for days if they have any sugar. For others, it drives their yeast allergy problem, or their yeast infection. Because sugar depresses the immune system, sugar is a bad idea for anyone with allergies, and anyone without allergies who might develop them in the future. Sugar also has a more insidious effect on the body that manages to get under the radar. I hear few people talking about this subject. Sugar works against the immune system, causing it to work much less effectively. It tends to cause the white blood cells to aggregate (clump together), which reduces their effectiveness against fighting bacteria and viruses. Many, if not most people are addicted to sugar. Sugar is not necessary in the slightest. If you don’t eat any, you’ll never feel the need for any, you won’t miss sugar at all. What ever level of sugar you eat is the level you think you need. Eat any less and you will start to crave this unnecessary food. You may feel that you lack energy until you eat sugar. If you reduce your intake of sugar (not easy, but possible), you will become used to that lesser amount of sugar and the cravings will fade away. If you reduce your sugar intake to zero, you’ll eventually get used to that and you won’t feel the need for any sugar at all. If you increase your sugar intake, your body will become used to the greater sugar intake, and will complain if you eat any less. Even if you feel unwell, which you probably do if you eat too much sugar, your body will still crave sugar. If you want to improve your health, you will do well to slowly cut back on your sugar intake, and keep it at a low level. This means cutting out convenience foods, a major step forward in your health right there. If you are addicted to sugar, your body goes though a kind of sugar cycle, a boom and bust, a rise and a crash. Let’s assume you’re addicted to sugar, and you haven’t had any for a while. So you eat a candy bar. Now your blood sugar shoots up. You have a temporary boost in energy. This energy boost is short-lived and rapidly drops off. Pretty soon you have less energy than you did before you and any sugar. So now you feel the need for more sugar, so you have another candy bar. Once again your blood sugar shoots up. This is very harmful to your body, your health, your weight and your self-image. 2) Because you are addicted to it. If you reduce your sugar intake, you will find you don’t need sugar for taste. In fact, sugar masks the true taste of your food. Rather than adding sugar for taste, try improving the quality of the food itself. Over time you will become used to less sugar, and you’ll find you can really appreciate your food. As for being addicted to sugar, you have to decide if you want to control your sugar intake, or do you want it to control you.